This warming and comforting leftover turkey and vegetable soup is a handy recipe to have up your sleeve during the festive season! Many of the recipes I share are adapted or inspired by my Gran. She was a fantastic cook in her day and one of her specialties was soup. 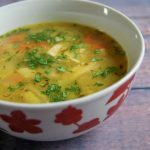 Just like my tattie soup recipe, there’s nothing fancy about this recipe at all – it’s good, homely comfort food. Since many of you were celebrating Thanksgiving in the USA yesterday and might have a fair bit of leftover turkey, I thought that today would be a perfect time to post this recipe. The recipe would work just as well with chicken though, of course! In fact I often make it with a leftover chicken carcass when my boys have a cold – I strongly believe it is the best medicine when you’re feeling under the weather. I like to use scotch broth mix in this recipe, but sometimes I ring the changes by adding white long grain rice. Please bear in mind that if you use rice you’ll probably need to add more stock. The recipe below is exactly how I always make it – but please feel free to adapt it. You can add whatever veggies or herbs you might have to hand. Think of the recipe as a blueprint – it’s very adaptable. Don’t you just love that kind of cooking? Once the vegetables have softened, pour in the hot stock, add the scotch broth mix, fresh herbs and leftover turkey, pop a lid on the pan and simmer on a low-medium heat for 1 - 1 1/2 hours. Check the soup for seasoning before serving.